David Duckworth is a multi-faceted pianist and entertainer with a range of styles, David can provide live piano music for special events such as weddings, parties, dinners, receptions, and more. He also works full-time as a producer of albums/CDs and can be contracted for musical recordings and productions. David Allen Duckworth began formal music training at age 5. He was fortunate enough to have in the neighborhood Marjorie Gloyd, active leader in the National Federation of Music Clubs. The 13 years under her tutelage included master classes and private sessions with various performing professionals, such as Eugene Istomin, presider of International Piano Competition, UMD, and her son Russell Gloyd conductor/arranger/producer of Dave Brubeck Orchestra/Quartet and Vince Guaraldi group. David studied jazz as a child, with various instructors recommended by Mrs. Gloyd, but his chops began to take on a personality of their own when he served as the pianist for the now internationally famous "Boilermakers," based out of Pittsburgh, PA. Under the leadership of Jay and Paul Cosentino, this New Orleans Jazz Band played in various places in the Pittsburgh area for the 18 months David was with them. After moving to Savannah, David has continued to be an active jazz pianist, and has produced four CD's of his own jazz arrangements for Manion Music. Kim Polote, Savannah, Georgia native Kim Polote is a professional singer, motivational speaker, and entertainer. She and David have performed together for the MCI and PGA golf tournaments, the Media Research Group, and the Savannah Music Festival. Her live performances with David Duckworth have been nationally aired on the Emmy-nominated “Great Hotels” show of the Travel Channel and “Paula Deen’s Cooking” of the Food Network. Her theatre experience includes the role of Maria in “The Sound of Music.” Her awards include runner-up of Miss Savannah, and the Gold Medal of the American Traditions Competition. When performing as a duo for a party, Kim and David use a portable 300 Watt PA system, capable of accommodating a room of up to 300 people. The speakers are two-way 10-inch speakers, mounted on stands from 4 to 10 feet high, and produce a high fidelity sound. Kim sings using a cordless microphone, to allow maximum interaction with the guests during the performance. David sings back-up vocals and plays two keyboards, one with a grand piano sound, and the other with the bass and drum-machine. If a well-tuned baby grand is available, David will play the grand piano with one hand and the rhythm keyboard with the other. There are no pre-recorded tracks; all the music is performed live, so that the music may continue beyond the original length, when necessary. Kim sings and serves as the role of master of ceremonies. Kim Polote also performs with David Duckworth as a trio (add upright bass), a quartet (add drums), and a quintet (add tenor saxophone). Alisha E. Duckworth, bassist, has been a musician in Savannah almost as long as she has lived here, since 1992. She met her husband David as his guitar student, and soon started leading praise music for Christ Church. Alisha's vocals and guitar playing have been recorded on two albums. As a bassist, her recent performance venues include the MCI Golf Tournament, the Nantucket Clipper cruise ship, and the 2nd Annual Johnny Mercer Festival. She can be regularly heard playing bass violin with David in a jazz trio every Thursday, Friday, and Saturday evening at the Mulberry Inn in Savannah, Georgia. 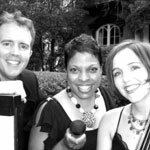 When performing as a jazz duo for a party or other event, Alisha plays a Christopher upright bass violin with a Peavy bass amplifier. Where a well-tuned piano is not available, David uses a weighted 88-key keyboard played through a portable 300Watt PA system capable of accommodating a room of 30 to 300 people. The speakers are two-way 10-inch speakers, mounted on stands from 4 to 10 feet high, and produce a high fidelity sound. Thank you for the fabulous job you did at our wedding reception. You came highly recommended and you still managed to far exceed our expectations. You are both very talented musicians and we feel very lucky to have had you involved in our special day. In addition, we appreciated how kind and laid back you both are, and it really meant a lot that you let our friend Amy sing two songs with you. Thank you again for everything! A special thanks to David for playing at our ceremony. So many people complimented me afterward about how amazing it was to have the Vivaldi song Crescendo as the horse and carriage arrived. Thank you!